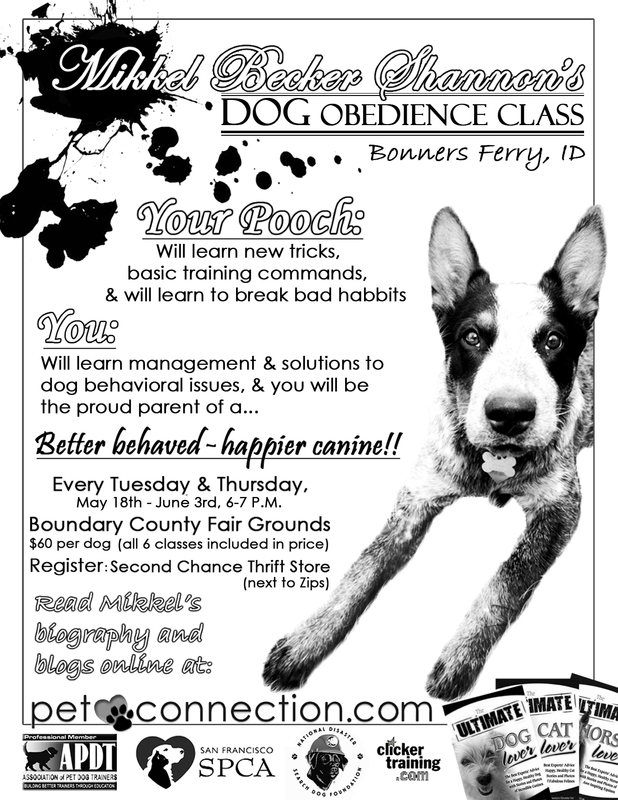 Dog trainers in North Idaho. How do you train your dog to obey without a bribe? Isn’t this what we all want? Trainers recommend using treats, toys, affection, play drive, pain and fear to get our pets to do what we ask. Is there such a thing as a dog that wants to do what we ask? All dogs need different levels of motivation but how do we actually build a relationship? Here is a link that describes the different methods used in training. This page explains positive reinforcement, negative reinforcement, positive punishment, negative punishment, flooding, luring, extinction etc. Here is a link to Silvia Trkmas’s training philosophy. My favorite is “9. dogs work best when they work for themselves. Don’t ask them for a favour to work with you. Make them ask you for a favour to work with them.” Watch some of her videos on youtube and you will see why she is a 2 time world champion / 12 time world team member in agility. I’m going to post videos as I find them to this blog. Please leave feedback and tell us what you do! Posted on December 13, 2010 Categories Behavior, TrainingLeave a comment on How do you train your dog to obey without a bribe? Who is your favorite dog trainer? Posted on October 23, 2010 Categories TrainingLeave a comment on Who is your favorite dog trainer? Last night was Pawsitive Works’ first Gala Dinner fundraiser. It was a hit! With a dinner at 41 South, auction items from EZY Dog, Amara Spa, Coeur d’Alene Resort and more it couldn’t have been a more perfect night. What is Pawsitive Works you say? Pawsitive Works works with at risk teens, through training shelter dogs both dog and teen benefit the community. Teens are taught positive dog training methods and work with one dog for 4 to 5 weeks, training sits, downs, leash walking and how to be polite. The dogs teach the teens responsibility, compassion and patience. See what the Daily Bee said about Pawsitive Works by clicking on the photo. Pawsitive Works has been the dream of Karen Schumacher of Bonners Ferry for over 5 years. She has headed up this program in Bonners Ferry, Sandpoint and now the program will be having its first session in Coeur d’Alene this October. Next on the list is Spokane and Creston. These cities have been asking Karen to open programs in their cities too, so Pawsitive Works is looking for more funding and volunteers to be able to provide more of these programs. Currently Pawsitive Works is also working with different research groups in order to show how beneficial this program is for the youth and the dogs. This is the amazing part of the program: teens that have been in this program aren’t re-offending and dogs in this program become more adoptable. 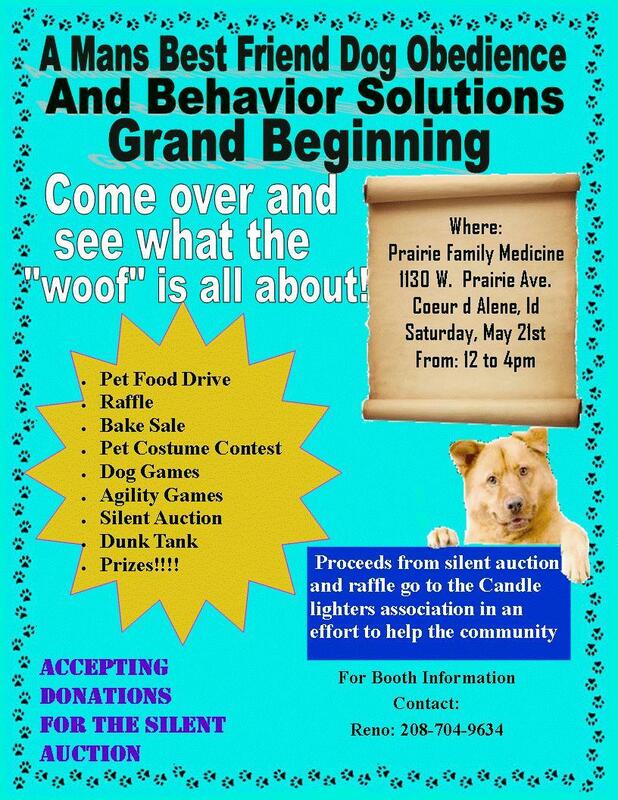 Both the teens and the dogs are performing a community service and changing a life. If you are interested in learning more about Pawsitive Works go to their website, click on the photo to read an article about them in the Daily Bee or comment on this post – I am the Youth Adviser/Trainer for the Sandpoint program and would love to answer your questions! Posted on October 2, 2010 Categories News, TrainingLeave a comment on Pawsitive Works! Training without bribes or force – is it possible? Is there training for a dog that doesn’t require you to carry treats, toys, leash, prong collar or e-collar remotes for the rest of your dog’s life? How do we get our dog to do what we want, when we want without external reinforcers or fear? First you have to be able to communicate with your dog what you want. This means that you need to teach him what you expect of him when you use certain English words or specific body movements. This is when you will greatly benefit from the use of training tools. Training tools range from harnesses to e-collars, short leads to long leads, play to reduced social interaction, dog kibble to McDonald’s cheeseburgers and everything in between. We all know that food is typically the best motivator for getting our dogs to do things that we want them to. We must first find out what our dog finds the most rewarding: a certain type of food or a special toy… We can use these things to lure behaviors and reward behaviors. Through this process our dog learns that when we say sit we expect him to sit. Once a dog understands what we want we can quickly phase out the tools. This means you can start to give the treat (or other reinforcer) to the dog only intermittently, say after doing two behaviors that we want, then every three behaviors, back to every two times and so on. What really works great is mixing this up so we make it like a gambling experience. If we put in a jackpot every now and then (a jackpot needs to be something so wonderful the dog will never forget that he got it for doing what you asked) the dog will always wonder if he’ll get that jackpot for doing what you ask. Incorporating in what has now been termed ‘life rewards’ also makes this transition easier. Life rewards are rewards that you don’t have to carry in your pocket. These are things that your dog naturally finds rewarding in life, like sniffing. Here is one example: when your dog walks nicely on a leash you get to go forward (when the dog doesn’t walk nice he has to walk in the opposite direction until he is in the right spot and then he can go forward again). Here is another example: when your dog sees something that he is afraid of and does what you ask (i.e. gives eye contact and doesn’t immediately start reacting badly) you then take your dog out of the situation that scares him. You can also train with a friend and see if your dog will do what you ask when you aren’t looking at your dog(if no one is available to help maybe you could use a mirror). Posted on September 27, 2010 Categories TrainingLeave a comment on Training without bribes or force – is it possible? Does your dog have a special trick? Share it with us! Rawhides can be a great chew toy for dogs. They help keep their teeth clean, provide them with mental stimulation and can keep them from getting into trouble by chewing on other things. MAny dog owners have realized that giving your dog something do to keeps them much happier and less likely do perform behaviors that get them in trouble! But how healthy are raw hides? Other options, such as pigs ears, are said to be too fatty. What else should be looked at before deciding to give our dogs raw hides? Here is an awesome video from Kikkopup (a dog trainer with tons of great videos on youtube.com) that shows you how to deal with behavior that you would like to stop. Dogs love to do things we don’t want them to do and here is a great way to make sure that you aren’t inadvertently reinforcing bad behaviors or teaching your dog that he can’t trust you. What do you think about these methods? Have you tried them? Do you think it will take longer for your dog to understand using these methods? Do you think that your dog would respond better using a method like this? Mikkel comes highly recommended by Karen from A Family Dog. Mikkel has been teaching classes and helping individuals with great success. She is a proponent of positive training and uses clicker training to bring about the best results. There is a rumor that she might have the first class in Coeur d’Alene that focuses on mothers, children and dogs! “Mikkel Becker Shannon is a professonal dog trainer and author, and host with her father of “The Pet Doctor With Dr. Marty Becker” for ABC News.